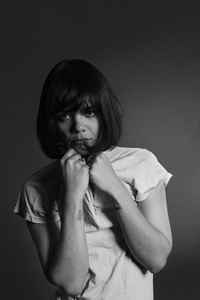 Bat For Lashes is a solo project of Natasha Khan, born 25 October 1979, a British singer-songwriter and multi-instrumentalist, based in Brighton (UK). Born to a Pakistani father, part of the eminent family of squash-playing Khans, and an English mother, her early childhood was spent travelling the world following her father who trained the Pakistani squash team, summers in Pakistan, and the rest of the time in Hertfordshire. She had a strict religious upbringing until her parents separated when she was 11 years old. Khan graduated in film and music, whilst at university her experimental work was influenced by artists such as Steve Reich and Susan Hiller, and she produced multi-media work centred on sound installations, animations and performance. She went on to work as a nursery school teacher, and it was during this period that she began writing the material for her first album. Bat For Lashes' music has been likened to the work of Björk, Cat Power, Tori Amos, and especially Kate Bush. The debut single, "The Wizard", was released digitally through label Drowned In Sound and on 7-inch through Khan's own imprint, She Bear Records. Later signing to the record label Echo and releasing debut album "Fur And Gold" on 11 September 2006. On 17 July 2007 "Fur And Gold" was announced as one of the 12 albums nominated for the annual 2007 Mercury Music Prize. Despite being the favourite to win, at the ceremony held at London's Grovenor House on Tuesday 4 September 2007, when the winner was announced by Jools Holland at 10:15pm she lost out to rank outsiders Klaxons. Her live / touring / backing band has included: Ben Christophers, Charlotte Hatherley and Sarah Jones (3).